This is truly an all in one back pack. If you want it for gym use, its ideal, if you need it for the office to look sharp, be sturdy, and completely function, it solves that problem... or if you're just getting away for the night and need a badass bag to throw your gear in, this is the answer. 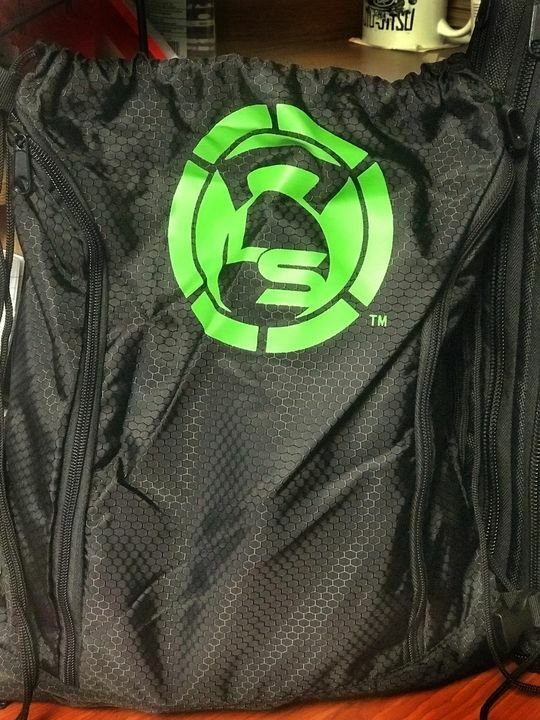 Get your new Limited Edition Onyx Back Pack while supplies last and feel the quality and know the excellence! Color: Black with vibrant green highlights Material: Ballistic Nylon Sizing: empty measurements: 23" tall x 18" wide x 8" wide. This is an over sized backpack that has more than ample room to fill to capacity. *all sale on this 50% close out special are final and no returns on this product will be accepted. Heidi C. Reviewed by Heidi C.
I ordered the bag because it was on such a great sale. I was blown out the water by what I received. The pictures provided do not do justices to the size and quality of the bag. I purchased it as a companion bag to my kickboxing and jiujitsu gear bags. It's perfecr and has room from everything I need. Vicki L. Reviewed by Vicki L.
I’ve had my bag for a couple weeks now and I love it! The big bag fits 2 adult jiujitsu gi tops and pants, belt, MMA gloves, 2 mouthguards, knee brace, 2 liter bottle of water, trail mix and a notebook that I track my conditioning in. PLUS there was still room to add flip flops, wallet, phone and keys, as well as some other stuff if I need. I use the little bag that can be fastened in the bigger bag when needed/wanted to hold my iPad, a couple paperback novels, small yearly planner, spare tee shirt, charging plug and cord and there is still a bit more space. This bag makes getting items I need to training each day more convenient. If you are looking for a great multi purpose bag this is the one to get! woohoo!! you absolutely rock!! thanks for the amazing review and great info! Truly appreciate our friends like you! Keep on keepin strong!! Irma U. Reviewed by Irma U.
Anthony S. Reviewed by Anthony S.
Shaun J. Reviewed by Shaun J.